After 1,161 miles of pedalling and many aching legs teams at Lanes Group plc from across the UK and Ireland have already raised £1,359 and 91 pence for five charities. The drainage and utility specialist’s depots – from Glasgow to London – have pedalled the length of notable geographical features up and down the country to raise the cash for good causes. Charities benefiting from the Lanes fundraising over the next five years are the Stroke Association, Mind, The Jack and Jill Children’s Foundation, The Sick Children’s Trust, and Sarcoidosis UK. Depots taking part in the Cycle Challenge selected rivers, canals and even mountains to cycle along and around – to set a target distance for the team events. Every penny raised by individual employees will be matched by Lanes. Eleven colleagues at Lanes Group plc’s Glasgow depot cycled the length of the River Clyde – 176 kilometres – and beyond. As with all other teams, the pedalling was done on exercise bikes in depot offices. A team at the Lanes Group operational hub in Slough, Berkshire, pedalled 268 kilometres, the distance from Newbury along the M4 and then around the M25. Three teams of seven pedalers at the Leeds depot clocked up 412.9 kilometres to make sure they covered the length of the River Aire, and a bit more. Teams in East London, Manchester, Washington, Tyne and Wear, and at AQS Environmental Solutions, in Ireland, have also taken part in the Cycle Challenge, which aids team fitness as well as the five charities. In Manchester, Janine Mills took part just over a year after she collapsed at work and nearly died after falling critically-ill with sarcoidosis. Fast action by her colleagues in administering first aid, then paramedics and emergency doctors saved her life. 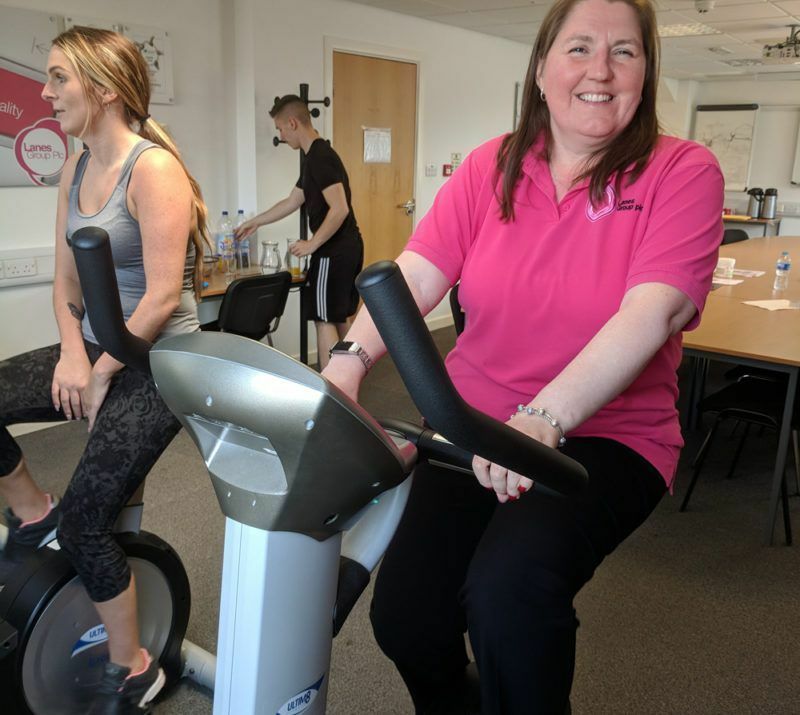 Health and Safety Administrator Janine, aged 50, was determined to take part, and cycled for six minutes, because SarcoidosisUK is one of the charities Lanes is supporting. Lanes Head of Marketing Michelle Ringland said: “We hope more depots will rise to the Cycle Challenge over the coming months to add to the fundraising total.